Panchuk, Gordon Bohdan [Панчук Богдан] – teacher, community leader; born on 8 February 1915 in Meacham, Saskatchewan, Canada; died on 20 June 1987 in Montreal, Quebec, Canada; buried in the St. Volodymyr Ukrainian Cemetery, Oakville, Ontario, Canada. Panchuk attended schools in Meacham and Saskatoon and, in 1934-35, a teacher training institute in Saskatoon. There he joined the Ukrainian Greek Orthodox Church of Canada and became active in the Canadian Ukrainian Youth Association, affiliated to the Ukrainian Self-Reliance League of Canada. From 1935 to 1939 he worked as a school teacher in Yellow Creek, Saskatchewan. In 1939 he enrolled as a student at the University of Saskatchewan. In 1940, after the start of the Second World War, he joined the Royal Canadian Air Force (RCAF) and underwent training in wireless operations. At the end of 1941 he was posted overseas to serve with the Canadian armed forces in Europe. Initially stationed in Northern Ireland, he was later based near Digby in Lincolnshire, England. 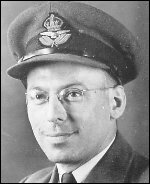 In August 1942 he was attached to the RCAF intelligence service. He was one of the organisers of the UK-based Ukrainian Canadian Servicemen’s Association, which was formed in January 1943, and was its president throughout its three-year existence. In 1943 he was also elected president of the Ukrainian Social Club in Manchester. On 6 June 1944 (D-Day) Panchuk took part in the Allied landings in Normandy, and then for two years remained on active duty in France, Belgium, the Netherlands and Germany, frequently visiting the UK when on leave. After the end of the war in Europe in May 1945 he became one of the main organisers of efforts to bring relief to Ukrainian displaced persons and refugees in Europe and to prevent their forced repatriation to the Soviet Union. He was one of the founders of the London-based Central Ukrainian Relief Bureau (CURB) and became its first director. He also helped to organise the Association of Ukrainian Soldiers in the Polish Armed Forces which, in January 1946, became the Association of Ukrainians in Great Britain (AUGB). In May 1946 he returned to Canada and was discharged from the RCAF. In October 1946 he came back to London as the head of the Canadian Relief Mission for Ukrainian Victims of War, which operated until July 1947, and travelled extensively in continental Europe, visiting displaced persons camps. He became director of CURB for a second time until his resignation in December 1947. From March 1948 to March 1949 Panchuk was president of the AUGB. He was a member of the Council of the Ukrainian Autocephalous Orthodox Church in Great Britain (1948), of the AUGB’s Relief Board for Ukrainian Students in Great Britain – KoDUS (1948-1949), and of an initiating group for the establishment of the Association of Ukrainian War Veterans in Great Britain. He was also an active supporter of the Ukrainian National Council. As a result of a split which occurred at the March 1949 AUGB annual general meeting (against a background of party political differences) Panchuk led the formation of a new organisation called the Ukrainian Bureau (on the basis of which the Federation of Ukrainians in Great Britain was established). In August 1950 he was appointed European representative of the Ukrainian Canadian Committee, and in March 1951 he became the UK representative of the United Ukrainian American Relief Committee. In June 1952 he returned to Canada. In 1952-1955 he was head of the Ukrainian Section of the Canadian Broadcasting Corporation’s International Service, then from 1955 to 1980 he taught in a Montreal high school. He received a Bachelor of Arts degree from Sir George Williams University (1956) and a Master of Arts degree from the University of Montreal (1961). After his retirement he became rector of the St. Petro Mohyla Institute in Saskatoon. In the years after his final return to Canada from the UK he was also active in the Ukrainian Greek Orthodox Church of Canada (now the Ukrainian Orthodox Church of Canada) and in various Ukrainian organisations, including the Ukrainian Canadian Veterans' Association, the Ukrainian Museum of Ottawa and the Canadian Foundation for Ukrainian Studies. For his activities during the Second World War he received several decorations including an MBE award. His memoirs, Heroes of Their Day: The Reminiscences of Bohdan Panchuk, were published in 1983.